Property Owners: List your Midi-Pyrénées property on the premier site specialising in French holiday lets. More Info. A villa in Midi-Pyrénées is a very popular accommodation choice. Not only are the villas synonymous with a high level of comfort and cleanliness, they allow you to come and go as you please, doing what you want, when you want. A gite holiday has similar attributes, and when visiting this region, you can’t go far wrong by selecting one of the many Midi-Pyrénées gites. Whether you plump for a villa or a gite, you will have made the right choice. Toulouse, the regional capital, is often referred to as the Ville Rose because of the colour of the local brick. Among its more memorable sights is the Canal du Midi, a canal of some 240 kilometres that stretches from Toulouse to the Mediterranean. It has ninety-one locks as well as many other structures, such as bridges, dams and tunnels, and ascends or descends, depending on which way you’re going, one hundred and ninety metres. Also of interest is the Pont Neuf, a sixteenth-century bridge that sports seven arches in its span across the River Garonne, but which isn’t symmetrical. Its close neighbour, the Château d’Eau, was originally designed as a water tower, but now serves as a photograph gallery. Away from the bustling metropolis, time spent in the Pyrenees National Park is both good for the body and soul, with loads of fresh air, good walking and spectacular scenery. Cheese lovers won’t want to miss a trip to Roquefort, where you can visit the caves where the cheese is matured, while historians will take great delight from Cahors, a richly historic medieval town that’s famous for its streets, its unusual fortified bridge, and for being the birthplace of Pope John XXII in 1249. The gastronomy of the region is a fusion of both French and Spanish cultures, with some Gascony heritage thrown in. Local gourmet products abound alongside wonderful country-influenced dishes involving goose, duck and chicken. With such delights as Roquefort cheese and Croustade apple pie, the region is simply brimming over with tastes and flavours to excite and please. 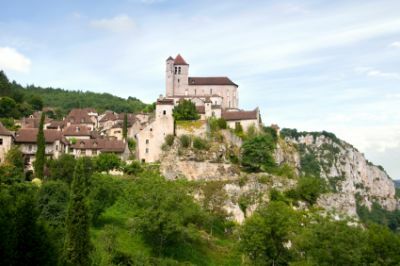 The cheese emanating from the region can certainly rival anything produced elsewhere, and besides Roquefort, you really should try Rocamadour, a sharp, acid-tasting little cheese made from goat’s milk. Others worth taking the time for are Fourme de Laguiole and Bleu des Causses, both made from cow’s milk, and Tomme des Pyrénées, a marvellous, mouth-watering mountain cheese. Garbure is a soup made from a traditional recipe, but there is so much in it, it’s more like a main course. In days gone by, it used to be the daily dish of the Gascon peasants, but is now considered to be a gourmet treat. The ingredients vary from season to season and from one place to another, but the basis is green cabbage and duck. Nowadays, the quality of duck meat is superior to that used by the peasants, and eaten with bread, it’s a very tasty and filling dish.